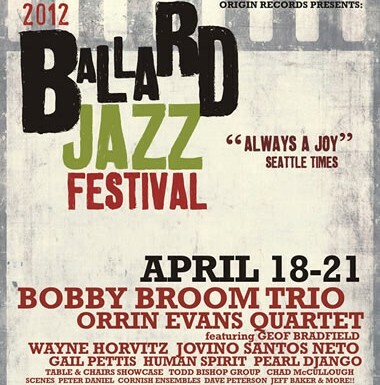 Heading up to Seattle to play the Ballard Jazz Festival in a moment. Tonight is the Brotherhood of the Drum, hosted by Michael Shrieve, which I’ll be playing with saxophonist Rich Cole and bassist Paul Gabrielsen; also featured are Sonny Rollins drummer Kobie Watkins, Eric Eagle, and the massive King Tears Bat Trip. Friday is the Jazz Walk, where my quartet will be playing downstairs at the Salmon Bay Eagles- that will be a good hang, because upstairs will be the Table and Chairs Label Showcase, which will feature players like Gregg Keplinger, Neil Welch, Greg Sinibaldi, and more. We play at 8pm tonight (Wednesday) and 8-12 on Friday. See the Origin site for further details. UPDATE: We got a lot of great feedback on the new CD, and had really fun shows on Wednesday and Friday- thanks to the musicians, to all the nice people who attended (and who bought CDs!) and to Kobie Watkins and Michael Shrieve for being incredibly nice and for buying my book, to Gregg Keplinger for working on my cymbals and for being very supportive, and of course my friends and family, and everyone at Origin for putting all the hard work putting on the event.